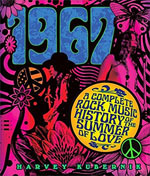 Author Harvey Kubernik may not have attended the first Love In or been a part of the audience to witness the Monterey spectacle, nor been there to see the Jefferson Airplane and Quicksilver Messenger Service playing their very first shows at the Matrix and Fillmore in San Francisco. But reading his book makes you feel he was present at every one of the magical moments he describes in his spectacular new book on the Summer of Love. Kubernik digs deep to uncover and reveal all the stories behind the music that made 1967 such a landmark year. There are interviews here with everyone from Graham Nash and Jerry Garcia to countless quotes from producers, executives, photographers (Henry Diltz's photos, which accompany most of the stories here, are marvelous), journalists, and cultural movers and shakers. It was a golden time, and Kubernik doesn't miss an ounce of sunshine. There are a few, niggling details--in a list of the artists performing at Monterey, The Who is omitted, and in a mention of the music stores who played key roles during that seminal summer, Sol Betnun's Music Store is mistakenly listed as Saul Bettman's--but these are insignificant trivialities when measured against the comprehensive tone of the book. This is a tough subject, but Kubernik handles it with care, finesse, and an obvious emotional attachment to that which he is writing about. There has been perhaps no greater year in the history of recorded music, and the author brings it all alive once again in his indescribably fun and informed book on the great year of 1967.